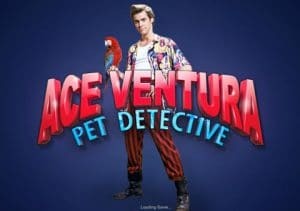 Ace Ventura Pet Detective is brought to you by Playtech and is based on the iconic film from the 90s which propelled actor Jim Carrey to Hollywood stardom. Incorporating fantastically funny moments from the movie, it has 5 reels and 243 ways to win and can be played from 40p to £16 a spin. The cartoon-style graphics and animations are superb with memorable, zany poses from Ace portrayed as reel symbols – you will also hear classic catchphrases as you spin the reels. Firstly, there are 3 wacky in-reel features which are randomly activated in the base game on any spin. The Jungle Friends feature sees Ace Ventura summon his jungle friends to turn symbols into extra wilds. The Sneaky Walk feature sees Ace sneak across the reels adding wild stacks. Finally, there’s the Loser feature when Ace can respin any losing spin with a 2x multiplier applied. If you still don’t have a winning combination, another re-spin is awarded with the multiplier increasing between +1 and +3 – you will continue to get re-spins until you have a winning formula. Then you have the Free Games feature where you help the whacky Pet Detective solve his case with the help of 6 unique Animal Modifiers – can you trigger the feature by getting the Rhino bonus symbol on reels 1, 3 and 5 at the same time. You will then receive 7 free spins with animal modifiers. The Animal Modifiers are collected during the base game which can be combined in the feature for spectacular wins – in the base game, look in the top left-hand corner to see them. Red Shark Animal Modifier: gives you a random number of additional free spins. There’s a maximum of 15 more free spins you can earn taking your total to 22 altogether. Pink Elephant Animal Modifier: this changes the game with 1,024 ways to win in play as an extra row of symbols is added (thus increasing your chances of winning combinations). Green Gorilla Animal Modifier: symbols in the feature are upgraded to a randomly chosen one which is higher value increasing your total win potential. Yellow Bat Animal Modifier: random wild symbols are added (randomly) on the reels for every single free spin. Orange Pigeon Animal Modifier: a random wild multiplier up to 10x is applied to any wild that lands on the centre reel. Blue Dolphin Animal Modifier: a mystery win multiplier is applied for all wins obtained in the feature – this is the most beneficial one I’ve found. I found the Ace Ventura Pet Detective game to be entertaining, graphically superb and with plenty of bonus features which can deliver big wins – the Jungle Friends feature gave 6 additional wilds which resulted in a 200 times stake win. The major wins will come in the free spins feature with the Blue Dolphin, Red Shark and Orange Pigeon Animal Modifiers combining to give me a 645 times stake win. It’s definitely one of Playtech’s better releases and one I am sure will prove to be a big hit with slot lovers – it’s also medium to high variance which helps. If you like branded slot games, Playtech offer you a huge range including The Avengers and Top Gun.